Community: Triwood – 19 St. & Chicoutimi Dr. N.W. Parking: There is free street parking as well as in a small parking lot. Typically opens mid-June until Labor Day – 9am-9pm. 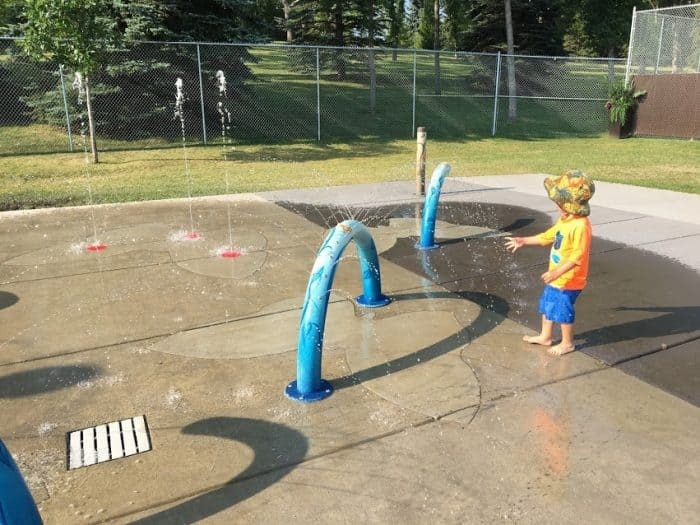 Features: Multiple spray park features. Washrooms are open seasonally. 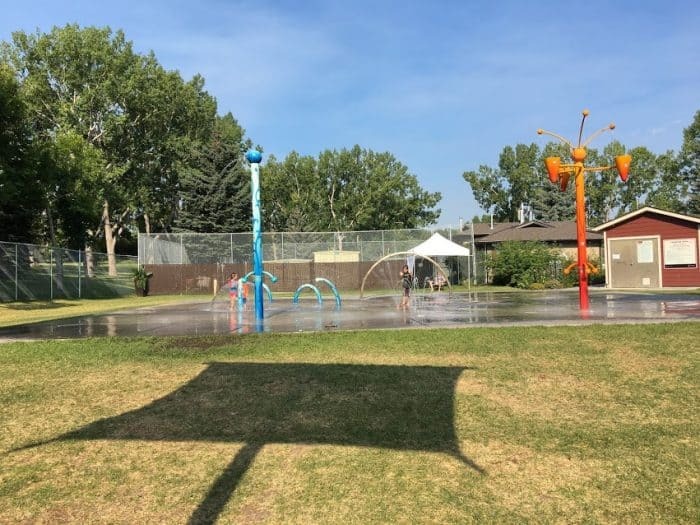 Surrounding Park Area: There is a huge grassy area that is used frequently by different ‘bootcamp’ groups to the SE of the spray park and tennis courts to the NW next to the parking lot. There is another grassy area with trees past the tennis courts where the mobile adventure playground sets up when it’s at Canmore Park. There is no playground in this park. Shade: Some of the south side from mature trees. There is a sunshade by one of the picnic tables. You may want to consider bringing your own shade. Seating: A few picnic tables and a couple of benches. They will fill up quickly so plan to set up on the grass. 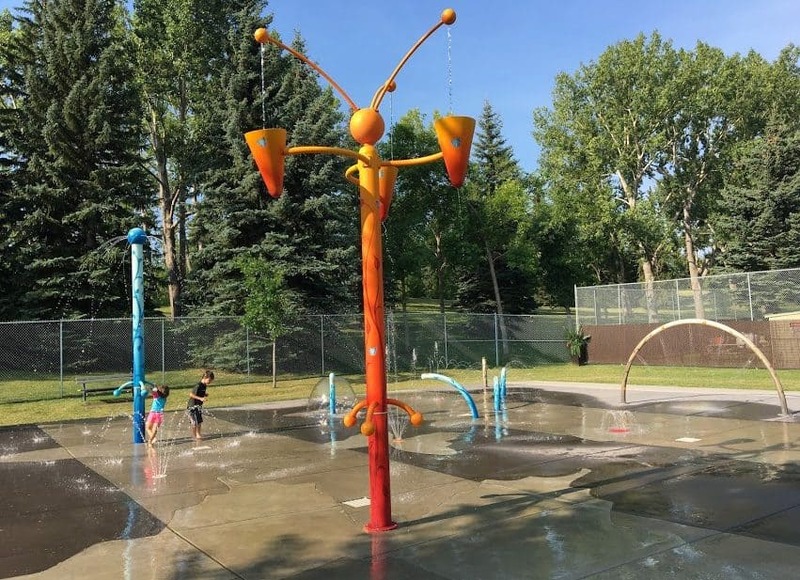 Overall assessment: This spray park opened on June 1, 2011. The water park operates on vibration sensors so if the water is off during operating hours it’s not closed, it’s just that no one is there. The spray park runs rain or shine and only closes if there is lightning. The two tall towers and the smaller brown post just need to be tapped to turn the water back on. 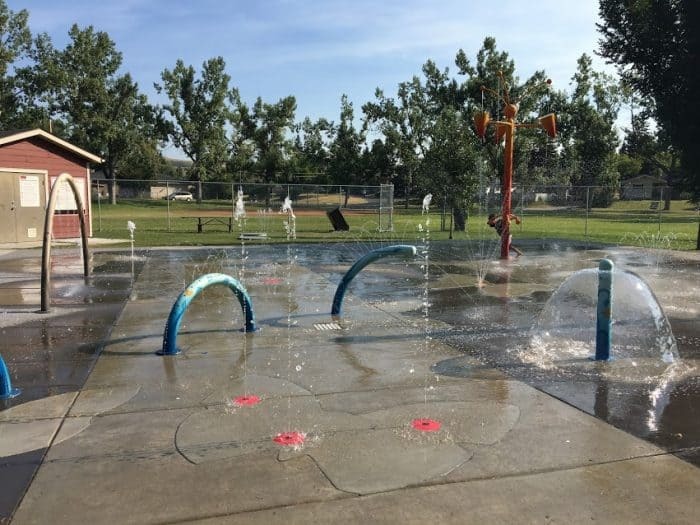 The water is chemically treated and re-circulated to conserve water and keep it clean for the kids to play in. There is an attendant there at all times to maintain and monitor the water quality who is also trained in first aid. 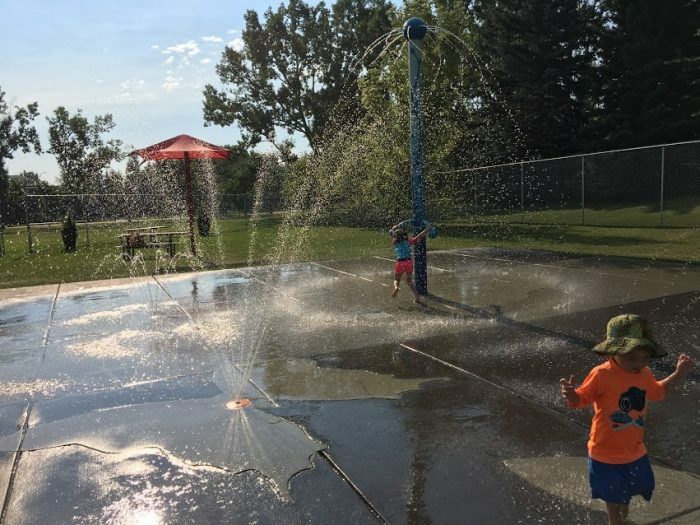 We’ve been to this spray park many times and always have a good time. If you want to avoid crowds try going early in the morning (it opens at 9am) or on a cooler day. 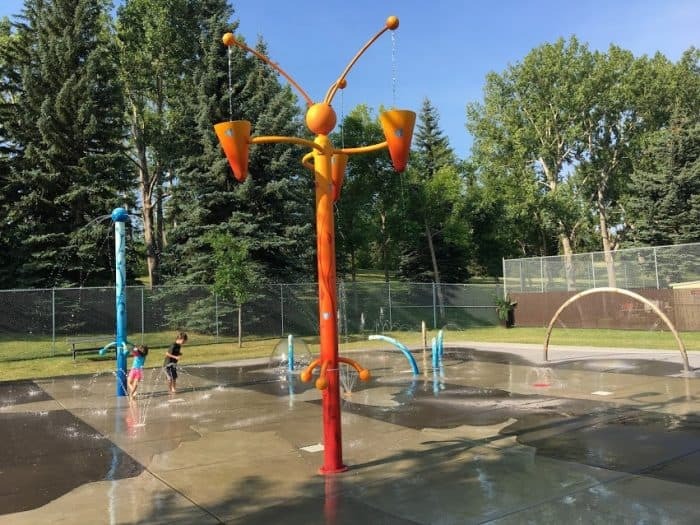 Its perfect for little ones who are a little hesitant about the water as they can hang out on the edges and play with the smaller sprays, but with the buckets of water that dump out and the towers that they can spin, it will still lots of fun for the older kids. glad your mum passed along this site for me! 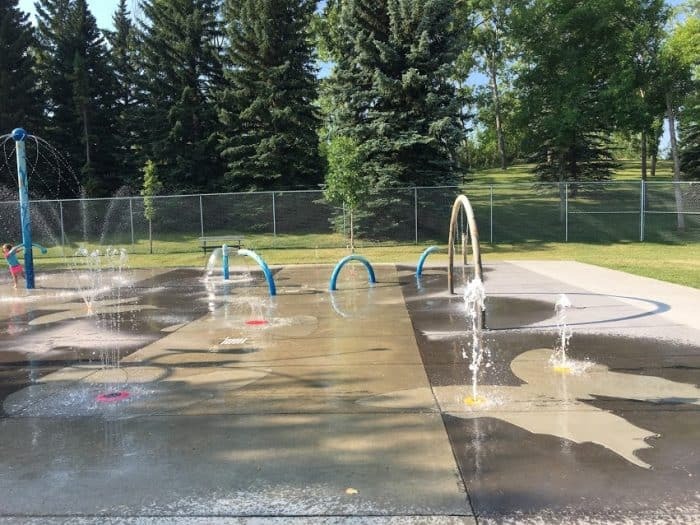 I was looking for a spray park to take a 2-yr-old and this one is actually really close to my house! Went yesterday and had tons of fun. Great for my 4-yr old and 13-month old. Not much for shade but just bring along your own shade, blanket and snacks and its the perfect day. Are the picnic tables installed yet, does anyone know? Are they somewhat close to the splash park? 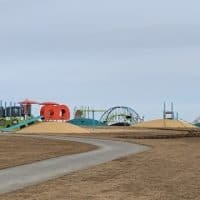 The temporary fence is gone (now there is only the permanent fence and I believe the picnic tables are installed and close to the splash park. I’ll be by this week to confirm. Thank you so much for doing this park review Dana! We just visited the splash park for the first time yesterday and it was really great. I would suggest bringing a day tent or something if spending the whole day there, as the shade is hard to come by. I went today – there are no picnic tables or benches inside the fence. There is a picnic table between the shed and the bathrooms behind the fence and a bench just outside the fence on the South side. I would definitely bring a blanket or lawn chairs and some sort of shade would be a super good idea if you have it. I just got a sportsbella from Toys R US and it was great. Hi there- we love the park. 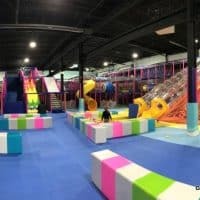 It’s in our neighborhood only minutes away and it’s quickly becoming a very popular place! The park is well-maintained and my 17 month old loves it! My complaint: many people are coming down and setting up “camp”. The relatIvely small grassy area within the fenced area is becoming a hot real-estate commodity and there is very little free space for a curious toddler to run about in. People are bringing tents, large blankets, lounge chairs, etc. 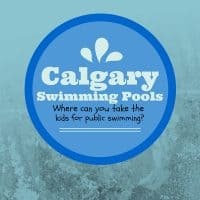 I understand that people want to have every “comfort” available to them while their kids enjoy themselves, but please keep in mind that the purpose/intention of the spray park is for kids to enjoy and run about freely- not so much as to encroach on the many real-estate boundaries people have set up. One woman even so boldly, while giving me the stink-eye, removed my child from her blanketed area because my curious toddler had overstepped the “boundaries”. I spent the rest of our visit at the park, redirecting my toddler and having a stressful time keeping her off others’ “property”. Great suggestion for Sport-brella – they look great! Thank for this website. It’s so helpful! I’m sorry to hear about your experience Anonymous. This happens to me and my toddler too. He’s a real explorer and doesn’t quite realize yet that everything does not belong to him 🙂 I always appreciate when people are kind about him exploring in, on or near their belongings as I work to redirect him. The stink eye is never appreciated! Can we do a Birthday party there? Can I Bring table and shade ? Hi Liliana, you can absolutely bring shade. The table would probably be best outside the fence of the spray park but there is lots of room there. A small party wouldn’t be a problem. 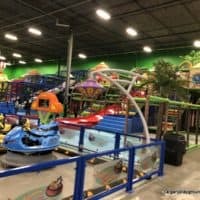 Did you end up having a birthday party there? How was it? We are thinking of doing it this summer.